Does this Muse single sound like A Little Respect? New Muse Single-Something Human This thread currently has 498 views. The new Muse single Something Human has been rumoured to soundvery similar to A Little Respect-what’s your take? I can only listen to the snippet available in the article, but it seems only slightly similar to me. I'm eager to hear the full song though. Muse are an incredibly talented group of guys who don't try to hide their influences - never copying and always making something amazing in their own style. If this new song sounds like Erasure, it was MEANT to sound like Erasure and I'm quite sure they are fans. PPS. New Muse album this fall - yay! Its on Spotify link above. "The track was co-produced by the band and Rich Costey and mixed by Mark ‘Spike’ Stent"
Mark 'Spike' Stent - that's an Erasure connection right there! He mixed the Cowboy album and worked on one or two other things in the early part of Erasure's career. The only similarity I hear is the use of an alternating major chord and the chord with a suspended 4th. I suppose the rhythm is somewhat similar too. Given the track a few listens and it certainly has an intentional, loving nod to A Little Respect - right at the beginning - but only enough to catch your ear. By the second line "I know it's self imposed", the song goes its own way. The rest of the song is certainly catchy in an Erasure-esque way (I also pick up hints of Blue Savannah), but a great original song of its own. I really like it and wow - Muse just never fail to impress me. The one time I saw them (around 2005) literally brought tears to my eyes during Butterflies & Hurricanes. They're just incredible. Frankly, beyond the superficial, I wouldn't even think to compare the two. I think it has an obvious retro-80's feeling, but not especially ERASURE nor "A Little Respect". Overall, "Something Human" seems to me being a good song on its own. Yes indeed, it's a very good song on it's own, but I have to disagree about the similarity to ALR. The guitar part and chord changes are exactly the same. 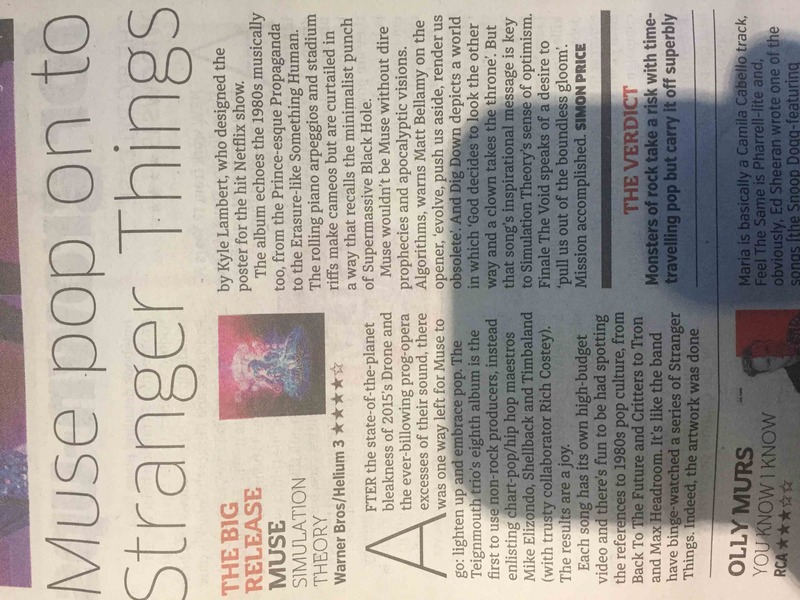 Perhaps a better way to phrase it would be to say Muse's song is a tip-of-the-hat or hommage to Erasure and ALR, rather than it "sounds like ALR." Looking forward to hearing the new Muse album tomorrow! I haven't heard any other tracks, but from the cover art it certainly seems like it will be a very retro- and electro-inspired album. Muse is no stranger to using electronics (particularly 2012's The 2nd Law with the single Madness) and I know they've cooked up something great. These guys are master musicians.